With a combined population of over 500 million inhabitants the European Union is a mind-boggingly bureaucratic and crazily complex confederation of 27 member states. With so much going on it’s no wonder many of these citizens don’t know the first thing about what the EU does, how it works, or even what it really is! 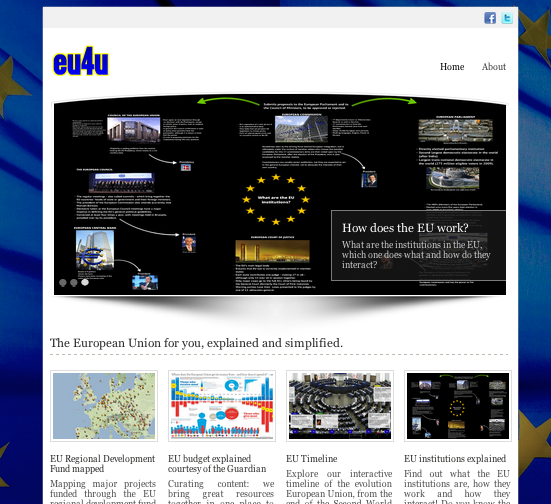 EU4U was a data-driven project which seeks to address this problem by promoting transparency and openness and making the European Union simpler and easier to understand. EU4U aims to present complex concepts with gorgeous graphics while retaining the original depth of data for those who wish to delve deeper.